Hemlock is an attractive, extremely versatile timber that is becoming more and more popular as a cost-effective substitute for white oak and ash. Grown abundantly across North America, where it can reach up to 60 metres in height, this sustainable softwood is cherished for its subtle growth rings and straight, clear grain that is practically knot-free. With a uniform density throughout, the timber will accept stain or paint easily and can be varnished to a pale amber sheen or a rich golden brown, depending on personal taste and whether you're aiming for a contemporary or traditional look. Pricewise, hemlock sits roughly midway between pine and oak, making it a good choice if you don't want to splash out on a premium timber but aren't overly keen on the knotty character of pine. As it has a fairly even texture, the grain is easy to work with – and being less brittle, and therefore stronger, than many hardwoods, it won’t split or crack while being shaped. This makes hemlock ideal for all kinds of joinery uses, including furniture, doors, floors, interior mouldings and, of course, staircase components. 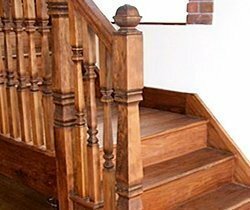 At Pear Stairs we can produce almost any type of bespoke staircase in hemlock or a range of other timbers, and we also sell stair parts through our online shop. Have a look at some of our case studies for inspiration, or try designing your own stairs using our online planning tool, the StairCreator.